These pages contain information about services for children and young people with a Special Education Need (SEN) or Disability. To view different services offered please use the categories listed on the right hand side of this page, there you will find information on what is offered and services provided. If you would like further information about Special Educational Needs, including how to make a request for statutory assessment, please contact the SEN Team on 01803 208274 or visit http://www.torbay.gov.uk/senassessments. For further information about the services the SEN team provides please refer to the SEN Team record within this Local Offer or visit www.torbay.gov.uk/sen. 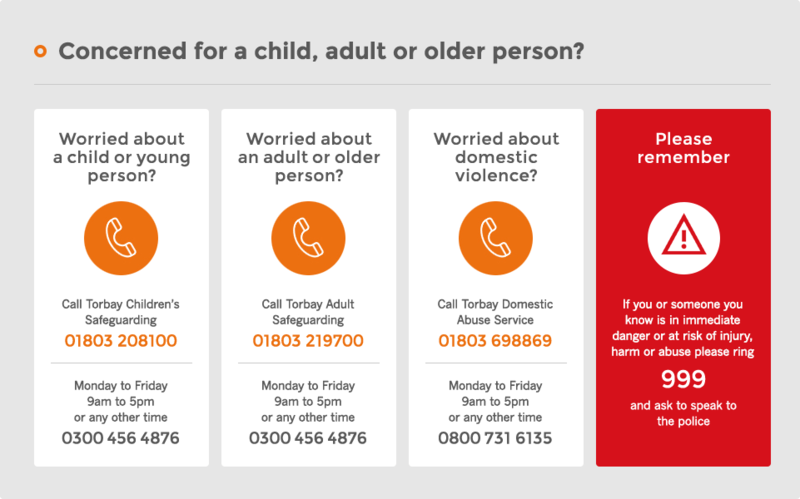 For information specifically aimed at Parents and Carers please visit http://www.torbay.gov.uk/sen-info-leaflets. We are trying to make sure that young people, parents and professionals can find out about the how the SEND reforms are leading to changes in Torbay. Please go to http://www.torbay.gov.uk/sendreform-updates where you will find the latest newsletters. If you would like further information about any work that is going on, please contact us on SENDreforms@torbay.gov.uk. The Local Offer is a requirement for the local authority to publish information about what provision it expects will be available for children and young people with SEN aged 0 – 25 years, both within and outside their local area. Arrangements for making complaints, for the resolution of disagreements, mediation and parents’ and young people’s right to appeal a decision of the local authority to the tribunal. The Code of Practice says local authorities must involve children in planning decisions about what services for young people with SEN are needed. This includes planning the content of the local offer, deciding how to publish the offer and providing feedback on the services contained in the local offer. Visiting Healthwatch Torbay to make a comment, or view comments left by others. You can view feedback already received by clicking here.